On the morning of the 21st, Officers investigated a domestic disturbance at a residence in the 700 BLK of Northern Ave. Upon arrival, both the male and female involved in the disturbance were still on scene. While inside the residence, officers detected the odor of raw marijuana and observed in plain view personal amounts of THC and drug paraphernalia. As officers concluded their investigation into the disturbance, they decided both the male and female would be separated for the night. As this was about to occur, the female party involved offered up a gallon sized Ziploc style bag containing approximately forty-two (42) 1/16oz gem bags of marijuana claiming the marijuana belonged to the male. Meanwhile, the male involved was making arrangement’s to leave on his own recognizance. Officers detained the male as he attempted to leave in a car driven by his mother. After seizing the marijuana that the female offered police, Officer Salzmann and his K9 Pyro did a drug search of the residence that led them to a specific backpack that contained a ½ pound of marijuana separated into ounce sized bags. Also in the backpack was a digital scale (used) along with multiple bundles of US currency totaling $13,000. See attached photo. 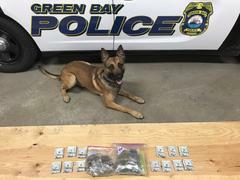 “This is the third incident in the last few weeks where our K9’s have been instrumental in keeping Green Bay safe and free of drugs in our community” said Chief Andrew Smith. “We are excited about the work the K9 Officers and K9’s are doing and are looking forward to introducing them to you on Wednesday at 11:00 AM at our K9 presentation at the Police Department,” said Smith.